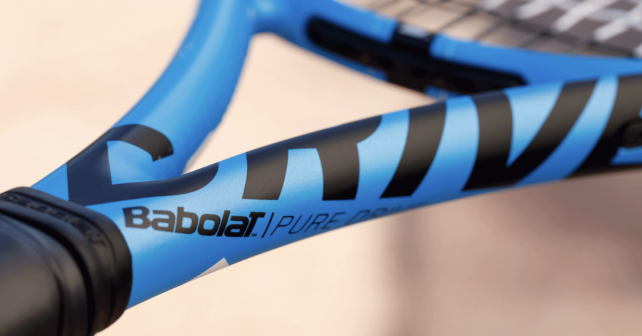 The Babolat Pure Drive is one of the true legendary racquet series. It has always packed intoxicating power and been advertised by players such as Andy Roddick and Carlos Moya. In February 2019 the series will get a new version – the Babolat Pure Drive VS. The Babolat Pure Drive VS will likely be a smaller head size version of the 100 sq inch Pure Drive (read my review of that racquet here). The beam design is rumored to be thin-to-thick and the racquet will likely play a bit like a stiffer Babolat Pure Strike 98 (read my review here). But it will still be interesting to see what kind of performance you can get from a 98 sq inch Babolat Pure Drive. UPDATE: The leaked pics and specs from the product catalog are not confirmed by Babolat and I was asked by the company to take them down since the racquet is a sample and a work in progress. Official cosmetics and specs will be released in February 2019. This post will be updated as soon as I find out more. The beam width is the one missing factor here. Based on the pics from Passionetennis.com it seems like it starts quite thin (21 mm perhaps) and builds up to standard 26 mm Pure Drive beam. According to rumors the racquets will sell in pairs where the weight is guaranteed as close to +- 1 gram. This is a very different take from Babolat. I guess they sell these racquets to a more advanced target group that usually buys at least two racquets at a time. But it does constitute a higher commitment when you have to spend around 500 USD for two racquets in one go. When I buy racquets I tend to always start with one in case I have not tried it before. And if I like it, I am ready to commit to getting two more. Three to four is usually a good number for a racquet you are intending to use in tournament and match play, at least if you are not on any kind of tour. What do you think of these new Babolat Pure Drive VS racquets? Interesting specs or just another 98 sq inch, 300 gram-ish racquet? Is this not the Dunlop Force Tour 98? I heard that Fabio Fognini was actually playing with a 98 Pure Drive, do you think thats true ? I got to the beam specs and they are 21 /23 / 21.